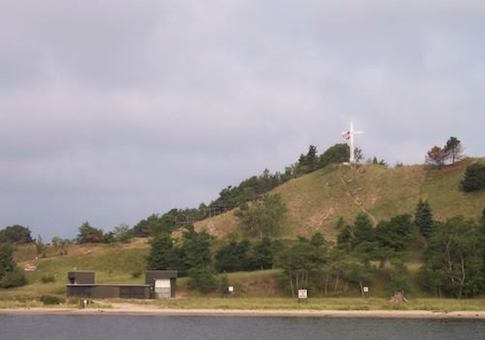 A cross that graced the top of a hill in the small city of Grand Haven, Michigan, for over 50 years will now be removed after the threat of a lawsuit by an outside activist who has filed other lawsuits to advance his cause. The Grand Haven City Council voted three to two earlier this week to have the cross removed from Dewey Hill. Their decision comes after months of heated debate, rallies organized by veterans, and heartfelt letters penned to the editor of a local paper in this city of less than 11,000 residents. "I never saw an issue quite like this," said Grand Haven resident Brandon Hall, a blogger for West Michigan Politics. While the issue was a contentious one it also showed the majority of residents were united. "One thing I want to make clear: Grand Haven is not divided. It is very united in support of the cross," Hall said. "All my atheist friends hate what is going on here," he said. "It’s very surprising that one guy can come from out of state and start all this. It is very shocking and disappointing," said Hall. He said many residents believe the council caved to a "bully." Mitch Kahle came into Grand Haven and threatened to sue the city if the cross was not removed. He also targeted a school club. Kahle is no stranger to pressuring governmental agencies. In Hawaii, his victories include the removal of crosses in various locations, church descriptions from the official Honolulu City website, and nativity scenes. In 1997, his first victory was forcing the Army to remove a 37-foot cross at Schofield Barracks. Kayle also received the coveted Freedom from Religion Foundation award for his work in convincing the Hawaii Senate to drop prayers to open legislative sessions. On his Facebook page, Kahle basked in the local media attention he garnered as a result of the cross removal. He wrote: "Our state-church victory in Grand Haven is covered today by the AP, the Detroit Free Press, WZZM13, WOOD8, FOX 17, The Muskegon Chronicle, The Grand Haven Tribune, and more …"
Kahle created the Remove the New Haven Cross Facebook page, and a message received by the Free Beacon asking for comment said, "We are pleased with the outcome." No further questions were answered and the person who responded did not identify himself. "Michael Kahle is a bully. He is an atheist extremist who targets Christians and gives atheists a bad name," Hall said. He said it was unbelievable that "our council gave in to this bully. Some chatter around the city this week is now centering around the possibility of recalling Council Member Robert Monetza, who voted to remove the cross. The two other council members who voted yes—John Hierholzer and Michael Fritz—cannot be recalled because they are up for reelection this year, according to Hall. Monetza did not respond to a request from comment, nor did Fritz. Hierholzer said he had no comment. Mayor Geri McCaleb asked what types of questions the Free Beacon wanted to ask and once they were provided by email she did not respond. "The cross has stood on Dewey Hill for 50 years and depending on what happens in the vote tonight, the story of the Dewey Hill cross will enter into a new chapter—either we'll fight on or we'll capitulate to demands of people who do not live in our community on behalf of other people who do not live in our community," McCaleb said on Monday night. "I understand the vast majority of our citizens prefer to keep the cross, possibly to even display it more often. Contrary to the thinking of our constitutional authorities, though, it really is a First Amendment establishment clause here. It's embodied in some 60 years of case law judgments," Monetza said before voting yes to have the cross removed. Monetza pointed out the city was faced with "the prospect of a grotesque circus of rotating and competing displays and messages. Further, there's nothing to keep the situation from escalating with more and more demand for expressive displays until Dewey Hill stops being a beautiful backdrop to our downtown and becomes a hideous billboard." Remove the Grand Haven Cross proposed three of its own displays to sit atop Dewey Hill: There is No God, Pro Choice, and Equality Now. But the battle for the cross may be far from over. "We in Grand Haven are ready for the fight. It is far from over. The council members forced this on the agenda, against the will of the people and the mayor," Hall said. The council members who voted to remove the cross, "sold Grand Haven down the river for 30 pieces of silver." Kahle is "underestimating GH residents. They value this tradition and we also don’t like a bully," Hall said. The Keep the Grand Haven Cross Facebook page announced it is accepting donations to purchase Dewey Hill. Update: This post has been updated; a reference to a satirical newspaper was removed.